Brainfingers is hardware and software. 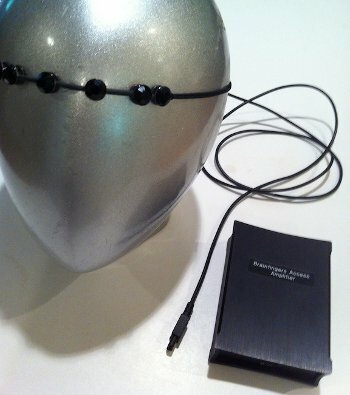 The hardware includes headband, amplifier and connecting cables. The software enables training and computer access. The headband senses and responds to surface electrical signals generated from muscle, eye movement, and brainwave activity detected at the forehead. The headband connects to the amplifier which filters, amplifies and digitizes the forehead signal. The amplifier connects to computer through a USB port. The Brainfingers Software within the computer further amplifies the forehead signal and uses patented algorithms to decode the signal into eleven frequency bands of information. These eleven bands span the controllable frequency range of the forehead signal. The four lowest frequency bands are responsive to lateral eye movements and theta brainwaves. The middle three frequency bands are responsive to alpha brainwaves. The four highest bands are responsive to beta brainwaves and muscle activity. The eleven bands can be used in combination or individually to produce virtual controls or Brainfingers. The Brainfingers are amplified over two million times. In this way Brainfingers become responsive to the subtlest of facial muscle, eye and brainwave activity. The Brainfingers Software includes a number of training windows designed to help learn to bring Brainfingers under conscious control. Included with the training windows are help windows and adjustment windows to allow a fine tune control of Brainfingers. Once control is mastered an editor window is used to build links or "Profiles" between Brainfinger controls and computer events. You then launch onto desktop and use Brainfinger controls to control computer and third party software. For example a user with ALS/MND who could only control a muscle or beta brainwave switch, would link their muscle or beta switch to a Left Mouse Click event. Then launch onto desktop and control an on-screen keyboard such as the Grid 2 bundle "Speedy Keys" in a switch-scanning mode. Brainfingers can be used to control the up-down and left-right movements of the mouse cursor as well as control mouse button and keyboard-keys. Go to Technical Details for a more in-depth discussion of Brainfingers.